?What is Medical Malpractice in Florida? ?The surgeon was supposed to operate on my right foot, but instead, operated on my left foot and I had to have multiple surgeries to correct all of the subsequent issues. Can I file a Florida medical malpractice claim? The Surgeon Left a Tool Behind After My Surgery Statistics show in almost 1,500 cases a year, a tool or surgical item is left in the body of the patient. This statistic is most likely underreported. In most surgeries, there is a team of medical professionals who work together to perform a procedure. People come in and out at various points in time to open an incision, extract something from the body, cauterize a nerve, irrigate the area or close the incision. Everyone has a unique role. These professionals may or may not have previously met or worked together but they are required to communicate effectively regardless of their relationships. Communication between all the medical professionals involved is absolutely necessary to complete a successful surgery. The vast majority of the time surgeries go as planned and without any error. Occasionally, surgeons or other surgical staff members make a mistake by leaving items in the body. Over the years of my practice I have observed the majority of surgical errors boil down to a lack of communication. There can be anywhere from tens to hundreds of different tools and medical equipment used in and around the human body during surgery. Things like pens (not the kind used to write), tape, gauze, clamps and other surgical tools are all commonplace. The doctors have checklists and procedures which the team follows to make sure every item which enters the operating room during surgery is accounted for afterwards. Often, surgical patients are put through an X-Ray to make sure nothing was left behind. But, mistakes still occur. Objects have also been found retained in the chest, thorax, spinal canal, brain, and other areas of the body. Sometimes whole items are left behind, and other times it is fragments of various medical devices. A sponge or towel may be difficult to distinguish from a tumor on an x-ray, causing improper treatment or unnecessary surgery. Not long ago, a woman was diagnosed with ovarian cancer and scheduled for surgery, the “mass” was actually a retained sponge from a Caesarian section. She ended up losing much of her small intestine and colon as a result of the error. Depending on what was left behind and where it was left, there may be no complications from an error. The patient may not find out about the mistake until it is found incidentally on an imaging report or in a later surgery. More often, patients develop complications when something was left in their body during surgery. The human body has an innate ability to protect itself. It more often treats an internal foreign body like it would an infection. The immune system kicks into high gear and sends blood to the site of the object, causing inflammation, swelling, pain and other signs of a problem. If you or a loved one is experiencing these symptoms after a surgery, contact your doctor or go to the emergency room for an evaluation. The Food and Drug Administration (FDA) lists the possible adverse effects from tools used during surgery left behind as local tissue reaction, perforation, infection, obstruction of blood vessels, and even death. How Often are Foreign Objects Left in the Body? It is difficult to say how often this happens, in part because it is believed to be significantly under reported. The United States Department of Health and Human Services estimates that the frequency is between 1 in 100 and 1 in 5000 surgeries. Other studies show the rate of objects left behind to be even higher: The Patient Safety Monitor Alert reported that 1500 tools annually are left inside patients, and a report from the Eastern Virginia Medical School stated that the expected rate of retained objects is between 1 in 1000 and 1 in 1500 surgeries. The patient is obese. Layers of fat tissue and skin are great hiding places for blood soaked gauze pads and towels. It is an emergency surgery. When the surgical staff is focused on repairing a traumatic injury or performing life saving surgery they are less likely to pay attention to smaller details. There was a change of plan during the course of the procedure. If something went wrong, a mass was discovered or something else mandated a change of plans, tools may have been put in place for a purpose which was never achieved, so the tools were never used. 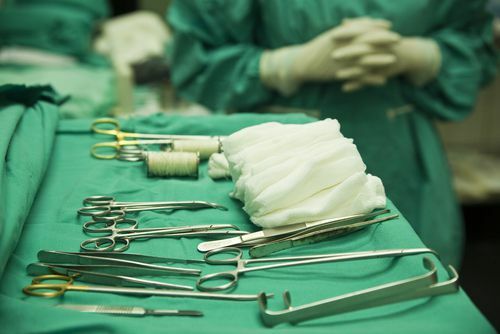 Not every retained item causes a problem, but a person who has suffered health consequences as a result of a foreign object left in the body during surgery may have grounds for a medical malpractice claim against the doctor and/or hospital. A surgical team is responsible for keeping track of all tools and equipment used in a surgery and for doing periodic counts of items during the procedure to ensure that everything has been removed before the incision is closed. When they fail to do this and the patient’s health is impacted, the patient should seek immediate medical treatment and follow up with a medical malpractice attorney as soon as practicable. There will need to be a through medical records review to pinpoint what went wrong and who committed the error. This should be done as soon as possible, because Florida has strict time limits on filing medical malpractice actions. Medical mistakes like this can quickly become life threatening infections. Another surgery may be necessary to remove the object and remove any infected tissue. These types of mistakes are a form of medical malpractice and can result in claims brought against the surgeon, surgical center and/or hospital where the surgery was performed. Keep in mind, there are always risks in any medical procedure, that is why you are asked to sign consent forms. It's important to realize that your surgeon or medical practitioner is not always responsible for adverse results stemming from your procedure. To have a legitimate medical malpractice claim, your surgeon or doctor had to have been grossly negligent.